Earlier this month, Anna Wintour's daughter, Bee Shaffer, married Francesco Carrozzini, son of the late Vogue Italia editor in chief Franca Sozzani, at Wintour's Long Island estate. But little is known about the occasion, as there was a social media ban and details and photos have yet to be released. But if you're itching for a glimpse of Shaffer as a bride, you're in luck. 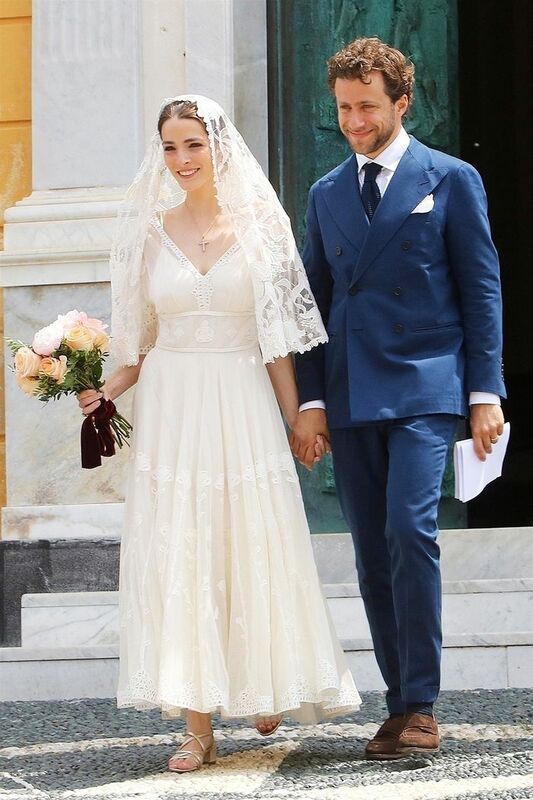 Photos from a second intimate wedding that she and Carrozzini just had a week ago in Portofino, Italy, just emerged, and it's the perfect Italian bridal look. Her romantic look included an ivory eyelet, tea-length gown complete with an elbow-length lace veil, a cross necklace, and metallic gold block-heel sandals to conquer the cobblestone streets in. We're sure Wintour had a hand in, or at least approved of, Shaffer's perfect wedding ceremony number two look. See it for yourself below and scroll through some of her Instagrams, which may help you to get to know her a little better. Who: Bee Shaffer and Francesco Carrozzini in Portofino, Italy. Thank you @pppiccioli and @maisonvalentino for such a beautiful dress! And congratulations to AW and Andrew on your best exhibition yet!!! You always wear it best... Happy Mother’s Day AW! Happy birthday mom! Thanks for seeing me through the tough times.